After long use, it smells pretty Unbearable from the inside of the hydro flask. At that time the question should rise that, in the easy way how to clean hydro flask. Basically, there are so many ways to clean inside this liquid carrier. But most of the ways people use to clean inside of this flask in the wrong procedure. As a result, it loses the temperature stabilization ability and maybe inside of this flask does not clean the proper way. After having a long observation on this topic, I decided to write on this topic. Let’s begin to know the right way. Hydro flask Cleaning Video Action. In order to situation and expectation, people have a different perspective. From that sense here I am going to present both of regular and natural way. This will helps you to select a suitable one for you. 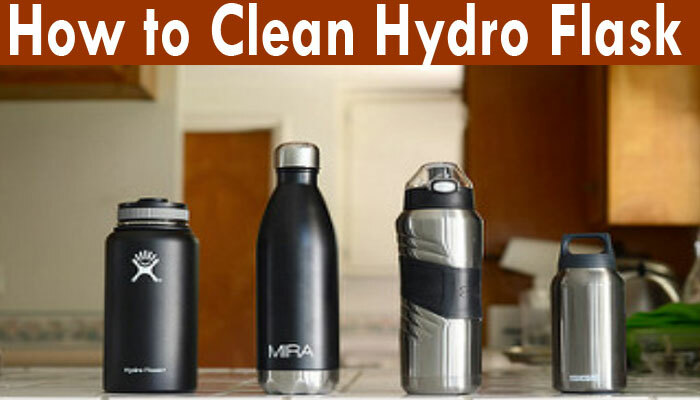 Regular way: To clean hydro flask in a regular way you need to have baking soda, vinegar and bottle brush. In each supermarket the Bottlebrush is available. Before clean the inner portion, clean the outer end with soap and scrubber. Then follow the steps below. Step 1: Engulf the baking soda and vinegar inside the flask. No need to take more than half a cup of vinegar. Then noddle the bottle properly. It will kill all the harmful germs. At the same time, it will clean all the spots. Step 2: Now put some hot water. It will help to reach the baking soda and the vinegar to each portion of the flask. Moreover, this is effective to clean old spots. But member never closes the cork with it in this time. Else because of vinegar and soda will react and make the flask damage. Keep the flask without shake in this condition for a few minutes. Step 3: Wait till the water become pretty cold. Then use a bottle brush. and abrade inside the flask properly. Don’t miss any of part of the flask. Rest of the abrading poured out all the water. And clean it again and again. Because of using baking soda it makes causes smell. After washing a few again and again by fresh water the smell will go. Most of the time people forget to clean the cap. It is a common mistake which is important like clean the inner wall. After over the process never tide the cap of the flask. It will be the causes of smell again. Better keep both of cap and flask in the open air. After dry properly you can tide them again. Natural way: In naturally, you need no soap or other artificial things. In the list of necessary things, there are ice and salt. There I want to mention, it the salt will sea salt it will work better. Because sea salt if a perfect natural refiner. Step 1: Put the ice inside the flask and fill it up to one-fourth portion. Avoid using big pieces of ice. Cube or small pieces of ice better. Then again avoid ice what already started to melt. Step 2: Add some salt. If you are going to use sea salt, then avoid big pieces. And of course, you have put the salt before melting the ices. Else ice melted waters will absorb the salt. Step 3: Shake the flask. There are no time bounding. As long as you don’t feel comfortable, shake it randomly. But as minimum time limitation, you should shake it more than 1.5 minutes or more. This will not only clean your flask, but it also works to reduce spots from the inner wall of the flask. At the same time, it is safer, cheaper and easier. Because of using soap, it may be smelled unexpectedly. But using ice and salt, it will never make any unexpected smell. Often you can notice, after cleaning the flask become clear. But still, the old smell of tea or coffee remains. Or it can be clean all smell but there smell of soap are remain. Those things are pretty horrible and unexpected. Ever after dry the flask, the smell remains there. Normally pure water cannot clean and fixed the problem. In those case, you can use a piece of lemon. Put hot water and a piece of lemon there. Then turn off the cap of the flask and seal the way to exit of vapor. After 10 minutes, outpouring the water and lemon. All the normal and semi-old smell will remove in this procedure. But if the smell is old of many months of the year, you can add a couple of tablespoon vinegar there. Metal scrubber: Inside the hydro flask there was a metal plating what works as a mirror. Basically, it works for reflecting the hit and keep away from changing the temperature. The metal scrubber may the causes of Erosion of this plating. There I suggest a use for brushes. Soap selection: Dishwasher bar soap contains a deep smell. After normal wash, the smell can’t eliminate properly. This is way liquid soap is the best thing. It will be better, after washing by liquid soap use vinegar. It will ensure you the inside on the flask without the unexpected smell. Chemical use: Stop use chemical to clean. It is not only dangerous for the physical condition of the flask, but also human. Beware before using the chemical. After wash: After wash does not keep your flask to oven for becoming dry. Because of extreme cold or hot, inside of the flask can be damaged. Keep it on the open air is the best thing here. No doubt that a dirty flask can make its user sick. Moreover, because of the musty smell, it can change the flavor of the entire drinks. Guess about a musty smelled tea, which is enough to spoil your morning. We appreciate you to keep care of your tools and have an enjoyable and healthy life.